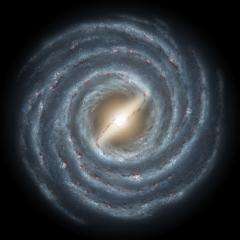 Artist's concept of the Milky Way galaxy, with the "galactic bar" visible in the center. Image: NASA. A team led by an Indiana University astronomer has found a sample of massive galaxies with properties that suggest that they may have formed relatively recently. This would run counter to the widely-held belief that massive, luminous galaxies (like our own Milky Way Galaxy) began their formation and evolution shortly after the Big Bang, some 13 billion years ago. Further research into the nature of these objects could open new windows into the study of the origin and early evolution of galaxies. John Salzer, principal investigator for the study published today in Astrophysical Journal Letters, said that the 15 galaxies in the sample exhibit luminosities (a measure of their total light output) that indicate that they are massive systems like the Milky Way and other so-called "giant" galaxies. However, these particular galaxies are unusual because they have chemical abundances that suggest that very little stellar evolution has taken place within them. Their relatively low abundances of "heavy" elements (elements heavier than helium, called "metals" by astronomers) imply that the galaxies are cosmologically young and may have formed recently. "The reason we found these types of galaxies has to do with the unique properties of the KISS survey method," Salzer said. "Galaxies were selected via their strong emission lines, which is the only way to detect these specific galaxies." Previous surveys done by others have largely missed findings these unusual galaxies. This is the 3rd or 4th time I've heard about these unusual galactic bodies. One thing that has been curiously left out however is the distance away from us that they are. Is it not possible that we are only seeing them as younger than normal because with great distances, you are also looking backward in time? Whereas if some of these are closer galatic neighbors, say almost (but not quite) as close as Adromeda for example, then yes, it is an oddity that warrents further study. It is hard to wrap your head around things like this when missing key bits of information. Are they in our "local" cluster, or are they on the other side of the universe where anything seen is seen how it was billions of years ago? "The chemical abundances of the galaxies, combined with some simple assumptions about how stellar evolution and chemical enrichment progress in galaxies in general, suggest that they may only be 3 or 4 billion years old, and therefore formed 9 to 10 billion years after the Big Bang." Simple assumptions can lead to horrible misunderstandsings of basic information.If nothing else, why not inform us of what these "simple assumptions" are. Cause you know, after all, I can make a simple assumption that the universe is infact made up of pixie dust, doesn't make it right or anywhere close to what is actually going on. While pixie dust is an over-exaggeration, the under lying point remains. The best assumptions are still just that, assumptions. I would love to see all the facts of this study laid out, any chance someone has a link to something more substantial than the AJL article? Maybe nucleosynthesis happens in plasma pinches!!?? "Is it not possible that we are only seeing them as younger than normal because with great distances, you are also looking backward in time?" Astronomers would obviously take that into account, otherwise they wouldn't be competent. "Simple assumptions can lead to horrible misunderstandsings of basic information.If nothing else, why not inform us of what these "simple assumptions" are." Well, the age of the universe is currently believed to be between 13.5 and 14 billion years, and this number is backed up by a massive amount of observational data, so I wouldn't be so brash as to just dismiss it as an "assumption". Might that explain why the Universe appears to be warping out to distinct points? While an interesting article, I would still back the galactic collision explanation over the one put forth. Why postulate massive galaxies that can assemble in a relatively short amount of time when galactic collisions can fill the bill? "An alternative explanation proposes that the galaxies are the result of a recent merger between two smaller galaxies. Such a model might explain these objects, since the two-fold result of such a merger might be the reduction of metal abundances due to dilution from unprocessed gas and a brief but large increase in luminosity caused by rampant star formation." Probably best to wait for analysis of the HST images, or relevant information derived from multiwavelength observations. BTW, any links to a (free) copy of this paper? Well, if new stars can form, why not new galaxies? Perhaps at larger scales when galaxies collide or do things similar to what stars do when they explode, perhaps this provides the impetus for galaxies to also form from the availability of new matter. If nothing else, I am happy to know that we haven't shoeboxed the whole universe into something common that we take for granted. The really interesting thing to me is their statement about the apparent age of the galaxies due to proportions of chemical elements. Does this strengthen or weaken the possibility of pre-existing matter from other galaxies somehow forming these newer galaxies. I too wish we had a clearer picture of their assumptions and the distance to the galaxies in question. Yah, they seem to make an unusual amount of sense out of Arp's measurements, for example. Axemaster, I wasn't dismissing anything as an assumption. I was simply quoting the article asking what "simple assumptions" they used because I felt that information to be relative to the topic. As for the competence or lack there of... This was more a jab at the over all lack of information on the study itself and the facts that were offered. @earls, Thanks for the link to the abstract. At least it has more specific details of its' findings than the article above. 1. Stars are powered mostly by repulsive forces between neutrons in their compact nuclear cores, not by H-fusion. 2. Mass fractionation covers the surfaces of the Sun and other stars with the lightest elements, H and He. 3. The "carrier gas" that maintains mass fractionation is the flow of H ions (neutron decay product) that are accelerated upward from the core by deep-seated magnetic fields. 4. When these magnetic fields fail to reach the surface, as during the Maunder minimum, mass fractionation decreases and the abundances of heavy elements and heavy isotopes of each element increase in the photosphere. That the galaxies were formed recently. Sometime in the last 3 to 4 billion years. Perhaps we should start looking for the exceptions to the rule in our galactic surveys. It may turn out, that this will shed more light on our universe and its structure, than the observations that fit our theories. Galaxy formation younger than the earth? Dark matter and dark energy supposedly make up 95% so not surprising this is nonsense. I agree with your statement assumptions can lead to misunderstanding. Such young galaxies would not be odd at all if the universe is a continuum without beginning or end. The more information like this comes to light, the more argument mounts against the expanding universe and the big bang. The universe is not 13 to 14 BLY old. The massive amount of data does not determine the age of the universe. 13.7BLY is simply the radius of the Hubble sphere. This has nothing to do with the age but is simply the time is takes a photon to loose all its rotational such that the red shift can not be distinguished from the Cosmic Microwave Background. Any light source emitted further that 13.7BLY away will therefore not be visible. Therefore, it is simply the limit of observation. Firstly, the more of these odd galaxies we discover the less likely collision can be the cause. Secondly, any collisions of galaxies would result in the emission of heavier elements similar to those observed in supernova explosions. Rather than the light elements observed. Thirdly Galactic collisions would not result in normal galaxies. Such galaxies would be largely distorted by the forces involved in the collision and would therefore not have the same shape. Each galaxy would have a distinctly different shape and different light emissions. Colliding galaxies have been observed and may be compared against the young galaxies in order to establish the probability of collision scenario over natural accretion. In my opinion it is more likely that these young giant galaxies are the result of an increased abundance of newly created Hydrogen and Helium atoms. The increased activity occurs where 2 or more jets of dark matter intercept in space. At these interception nodes dark matter is pairing up into photons and other subatomic particles. The jets of dark matter are emitted by black holes of galaxies. Such black holes may be far away from the position of the nodes. For young galaxies to form as quickly as observed, there must be highly active black holes which have axial alignment with these galaxies. In addition it is necessary for right handed as well as left handed spinning dark matter to intercept near the galaxy. Right handed spinning dark matter is required for the formation of electrons and left handed spin is required for the formation of protons. Left and right handed spinning dark matter is emitted as jets at opposite poles of black holes. The hypothesis of cosmologically young galaxies is not provocative when considering that the photon may consist of 2 items of dark matter as proposed by my theory of the Item. My theory may however sound provocative, but it is becoming more and more plausible as information such as black hole jets, young giant galaxies and other cosmological phenomena such as HST-1 cannot be explained by the current model. there are nodes where the activity of the creation of new matter is occurring at greater frequency. This anisotropic distribution has also been observed in the Cosmic Microwave Background. You will note that I am talking about newly created matter from dark energy and dark matter. This is a feature of the Continuum Universe which I would propose as a model which gives a far better fit to the observed. This model has no problem in accounting for the jets of black holes and young giant galaxies as well as dark matter and both aspects of isotropic and anisotropic characteristics of CMBR. Do not dismiss observations which are facts as nonsense just because you cannot make sense of it. Your model or theory is more likely to be incorrect, if the observation does not fit. @ Stein, do you have links to any published, peer-reviewed papers with Continuum Universe predictions on the precise spectrum of the CMBR anisotropies? I would be most interested in how they compare with the over 25 I've read based on variations of the Standard Model. What does Continuum Universe theory predict for the size of anisotropies Planck will detect? The nature of the black hole jets. The photon with a pair of dark item particles. Constant velocity of light & intrinsic property of photons. Beta decay which incorporates electrons and positrons and neutrinos as quark in baryon matter. I am withholding information of the details of the Item (dark energy) and dark matter but I am happy to release sufficient information of the proposed principles of destruction and creation of matter as it applies to the Continuum Universe model. To aid the reader I give examples which illustrate the process and the logical analysis of why I have come to the posted conclusions. 1. The space is flat with 3 orthogonal directions all perpendicular to each other. 2. The space does not expand or contract and is dimensionally stable and constant and equal in all 3 directions. 3. Black holes exist in locations where large amounts of matter has accumulated by accretion caused by gravitational forces acting on masses. 4. Black holes reach a maximum mass this gives galaxies stability and restricts the gravitational mass of black holes within the galaxies. 5. Matter accreted into Black holes in excess of the maximum mass will be ejected as Items in jets at the black hole poles along the axis of the BH rotation. 6. Items are dark energy which travels through space at the speed of approx 1.4 c Items have intrinsic energy which will only come into effect when they pair up. 7. Items can only pair to form 2 different particle pairs a Photon and a Varion. 8. The photon is the observable basic particle and the varion is the unobservable basic particle. 9. Due to the UV catastrophe the x-ray photons and varions are unlikely to be formed in conjunction with electrons and are generally formed in black hole jets by the pairing of items which have just been ejected from the black hole. Such photons and varions travel along the axis of the black holes. The handing of these particles is determined by the rotation of the black hole. The velocity of these particles is limited to c.
10. Electrons, positrons, neutrinos and antineutrinos are created by the pairing up of a photons with a varion. There are no other possible pairing arrangements than these four types. Due to the paring the velocity of these particles is further reduced which also gives them a component of mass. 11. The even and isotropic distribution of hydrogen and CMBR is because the positron is quickly annihilated be a nearby electron. This reaction emits 2 gamma photon and 2 varions. And because electrons generally orbit any matter particles they are in great abundance near matter. However in outer space devoid of electrons the positron can exist long enough to collect a Neutrino on each side which protects it from annihilation and in so doing forms a proton. 12. Hydrogen is formed when such a proton attracts a newly created electron. This electron will interact with free photons and causes the emission of isotropic CMBR. The emitted photons which interact with the electron of hydrogen and therefore will have a perfect black body radiation distribution which is governed by the electron orbital frequency of the hydrogen atom. This will follow the Plank distribution curve which peaks at the green frequency as would be expected. 13. The anisotropic distribution or hot spots or nodes of creation observed in the giant young galaxies are a special effect of the black hole jets which are very directional in their emission. Because in these jets have a high concentration of items there is also a concentration of pairing activity near these jets. When 2 item jets happen to meet in the same position in space. The 2 jets of items will interact at an increased frequency and photons and hydrogen is created more rapidly. There is also a greater concentration and higher incidence of CMBR in such locations which results in the anisotropic nodes which are being observed. 14. The HST-1 activity is the result of such a irregular interaction between jets the irregular nature is due to the irregular jet emission of the black holes. 15. I have specifically posted the 2 particle photon and beta decay to describe how and why the standard model should be changed to account for the observed astronomical observations. And at the same time how the model can be simplified. 16. I have posted the alternative approach to the relativistic nature of mass in order to account for the different mass of strange etc quark, and to incorporated the physical nature and variable mass of the photon within the same framework. 17. The red shift of light observed in distant stars and galaxies is caused by the interaction of photons with mass. Although dark matter does not interact electromagnetically with matter it does have mass. The photon exhibits a gravitational attraction towards mass this causes gradual red shift by reducing the photons rotation over large distances. A large concentration of mass causes the photon to change direction and a temporary Blue shift by increasing the photons rotation. 18. In order to account for the gravitational properties of photons which have no mass it is necessary to make a technical alteration to the model of gravity. Gravity is NOT caused by the attraction between 2 masses. Gravity is the gravitational attraction of one particle to the lack of velocity of all the others particles. Mass is the lack of velocity of a particle. This small change combines Newton s laws of gravity and the Lambda cosmological constant into a single phenomenon of gravity and leaves unchanged the basic laws of gravity and also account for the gravitational attraction of photons and the consequential red shift over time. This represents a major breakthrough in the identification of quantum gravity and the property of mass. You have the data and observations and can judge for yourself if what I propose does match or not. You should be able to determine if 2 or more galaxies have their axis aligned with bright young stars. And that may indeed be the proof we need to confirm ths aspect of the Continuum Universe. The above theory originates from the detailed analysis of the structure of the photon, subatomic particles and atoms. The cosmological detail proposed above is simply derived from the detail of the particles and their quantum interaction. It would be only polite and proper to make reference to this posting, if this information is used to describe the universe. If the model described above is indeed the model which can account for the astronomical observations of the universe. Any Nobel prices would be greatly appreciated, if the description of the cosmos, gravity and mass matches more closely to the observed. @ Stein, Thank you for your reply to my post and your description of the Continuum Universe theory. I'll make sure to fully credit you for this theory in future discussions of it with others. I'm curious, though, why you are " withholding information of the details of the Item...." ? It's just going to take longer to get that Nobel by keeping it all to yourself. Thank you for your response and yes it is going to take a little longer, if I withhold some of the information. But there is a reason for this. My theory of the Universe and Item goes much further than the current Standard Model and in addition it has features which are not in full agreement with the conventional thinking such as Quantum Chromo Dynamics, Big Bang Theory, expanding Universe, Relativistic Mass, Gravity, Structure of Nucleus, Beta decay, Photon wave duality to name some of the major issues at hand. I have posted some of the disagreement in my discussion on physorg/news in the hope to find some common ground. Any manuscript which I submit for review must be submitted in a way which allows scientist to review the theory or the model against known scientific principles which they know are correct. For some reason scientist must view the manuscripts in isolation so that only one new aspect is verified at each step. It would be nice to submit all or a number of the theory in a single submission. But the submission is too large for acceptance by the review board and covers too many fields of science. The truth is we have to much oil .